Oklahoma and China make music together! OKLAHOMA CITY, Okla. (August 23, 2017) - After eleven trips to China and last year co-hosting the Silk Road International Arts Festival in Xi’an, Oklahoma City based Kyle Dillingham and his band Horseshoe Road will be returning to China to headline the multi-cultural festival now in its fourth year. Following their performance at the Silk Road Festival in Xi’an, the band has been invited to perform at the 2nd Annual Silk Road International Cultural Expo in Dunhuang (the true crossroads of the East and the West along the Silk road). This will mark the first time an American Country band has ever performed in Dunhuang. Plus, Dillingham recently invited by the U.S. Department of State to participate in the American Music Abroad tour, along with an upcoming appearance on Woodsongs Old-Time Radio Hour. 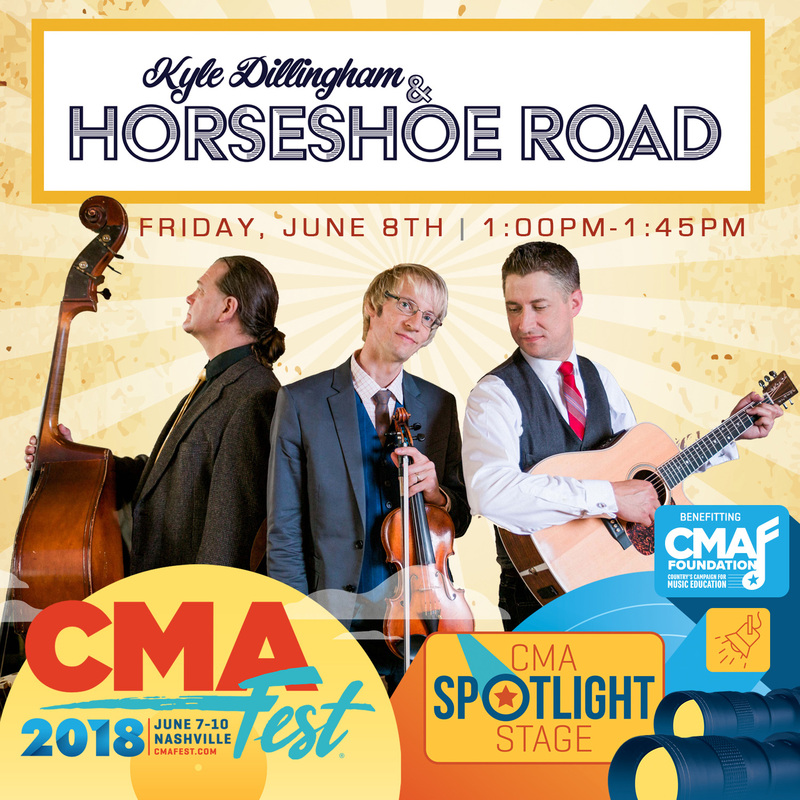 NASHVILLE, Tenn. – Kyle Dillingham is excited to announce that he’ll be making his 2018 CMA Fest debut on the Spotlight Stage inside Music City Center. Dillingham will perform at 1:00 pm CT on June 8, followed by a 30 minute fan meet-and-greet immediately after his performance. “How very exciting it is to be a new member of this CMA family! An important theme in education is, ‘it’s not what we have, but it’s what we give,’ and we look forward to giving our very best at CMA Fest this year to benefit the CMA foundation’s work enriching music education programs all across the country,” Dillingham commented. Dillingham is also celebrating a recent invitation to participate in the 2018-2019 American Music Abroad tour season, organized by The U.S. Department of State’s Bureau of Educational and Cultural Affairs, and The Association of American Voices. Dillingham and Horseshoe Road were chosen as one of fifteen ensembles, standing out in an applicant pool of nearly 300. The Bureau of Educational and Cultural Affairs is currently working to select the 40+ touring countries for the upcoming round of American Music Abroad, which will be announced at a later date. Additionally, Kyle Dillingham recently recorded a performance on Woodsongs Old-Time Radio Hour, which is set to air on June 23 via the program’s broadcast affiliates, and the American Forces Radio Network. WoodSongs Old-Time Radio Hour is both a radio and television production that airs internationally around the world, and fosters the comradery of both musicians and music lovers to celebrate the traditional American experience through song. Producer and host, Michael Johnathon has garnered mass multi-media attention over the past 15 years, which is filmed in front of a live audience in Lexington, Kentucky. MAY 26 Paseo Arts Festival / Oklahoma City, Okla.
JUN 08 CMA Fest Spotlight Stage / Nashville, Tenn.
JUN 14 CHK|Central Boathouse / Oklahoma City, Okla.
JUN 16 The Deli / Norman, Okla.
JUN 23 Americana Fest @ American Banjo Museum / Oklahoma City, Okla.
JUL 19 UCO Jazz Lab / Edmond, Okla.
For more details on show dates, please click here. Kyle Dillingham picked up the violin when he was nine, and eight years later, he gave two featured performances at the Grand Ole Opry in Nashville. Kyle is now managed by legendary impresario, Jim Halsey, who has guided the careers of many great performers including Roy Clark, The Oak Ridge Boys and James Brown. On stage, Horseshoe Road performs a mix of band originals, classic covers and fiddlin favorites that are sure to have audiences on their feet. Together, they have represented America internationally in 37 countries, energizing audiences everywhere they go.